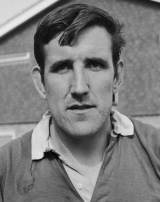 Delme Thomas was a lock who represented Wales and the British & Lions during a successful international career in the '60s and '70s, during which he also captained his country. Thomas also had a significant club career, notably the 1972-73 campaign with Llanelli when he captained them to the league title and also a famous defeat of the touring All Blacks, on the back of an inspiring pre-match speech by Thomas. He was a starter in the Wales team from 1966 and 1973, including the side that completed a successful Grand Slam in 1971.